If reports are correct, today's events would be the second time this year someone weaponized a motor vehicle to harm people in areas that are designated for New Yorkers to walk and bike separately from motorized traffic. Six people were reported killed and more than a dozen were injured when a driver in a pickup truck ran people over on the Hudson River Greenway this afternoon. The assailant drove a rented Home Depot truck “down a lengthy stretch of bike path” before striking a school bus near Stuyvesant High School, at the corner of West and Chambers streets, according to the Times. There were unconfirmed reports that the driver fired multiple gunshots before and after crashing the truck. Video posted online showed people and bicycles on the ground near the bike path. At least one body was under a tarp. The incident happened at around 3 p.m. WCBS reported that police shot the driver and took him into custody. Mayor de Blasio and Governor Cuomo were at the scene as of this writing. If initial reports are correct, today’s events would be the second time this year someone weaponized a motor vehicle to deliberately harm people in areas that are designated for New Yorkers to walk and bike separately from motorized traffic. Nor is this the first time a motorist has driven multiple blocks on the greenway with fatal results. In 2006 a motorist driving at highway speeds killed Eric Ng as he rode his bike on the greenway south of Chelsea Piers. 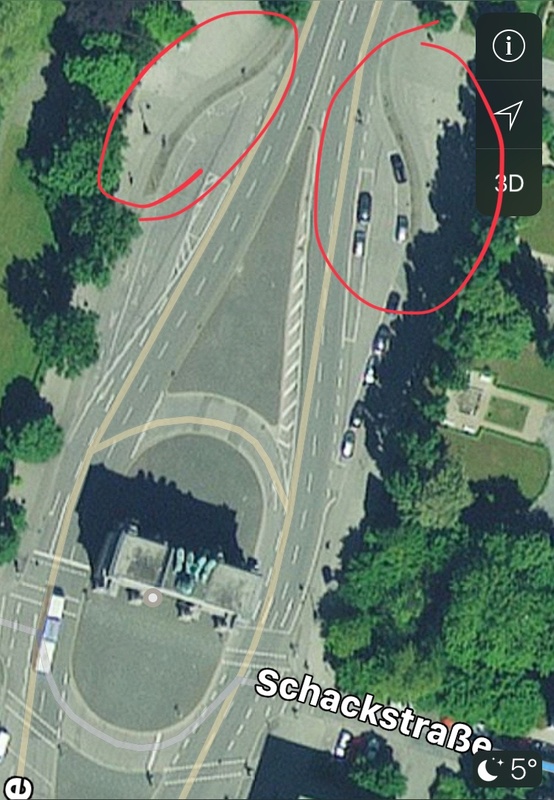 The city has made fixes since then, but there are still several greenway entry points that have no bollards to keep motorists out. We’ll have more on this story as more details are made public. Bollards like in the thumbnail above with chains strung between them aren’t your friends when you don’t realize there’s a chain running between them in the dark. We should be calling for a total and complete shutdown of pickup trucks entering New York until our country’s representatives can figure out what is going on. You didn’t really watch the video too closely did you. you guys are really over thinking this. One would have to be extremely stoned or rather stupid to be caught by these chains. Partial protection is still better than no protection. Don’t let the perfect be the enemy of the good. While the motive and the desired outcome of a terrorist is very different – the motorist who cuts me off doesn’t really want to kill me; he just doesn’t want to wait for me – making the streets safer from one kind of aggressor also makes them safer from the other. If we’re concerned about motorists who use their vehicles as weapons, let’s start taking the issue seriously. I didn’t watch it at all. I stand by my general observation of bollards with chains. Maybe these are placed where no one would ever want to cross, but I’ve had a frightening emergency stop in the past. In this case the bollards are really acting as fence posts. So how about we try to find a way to protect “easy, vulnerable, soft targets” from violence? For the record, since it appears repeatedly in thread. The Hudson Greenway is open North of Clarkson Pier 40/Houston. It has been since the attack. The City should report path openings closings like this to Google Maps as they have the highway and special event closings like Halloween Parade. Today at 5:15pm (Nov 1,2017) saw three NB cyclists riding West Side Highway with high speed motor vehicle traffic. They need to reopen the path where they can. Saw park and police vehicles driving up and down “closed portion.” What are cyclists going to disrupt that heavy trucks haven’t? Fingers crossed another cyclists is not killed because of unnecessary detouring. So you want massive concrete barriers everywhere? That is your ideal of liveable streets? No, by building massive concrete barriers to segregate us into classes, the terrorists have won. So, you never met a crisis or terrorist incident that you did not try to parlay into a self-serving ideological advancement? Maybe some of us do not want to live in a city with concrete barriers segregating us from each other? Deliberate acts of violence, as opposed to accidents, are a tiny percentage of what causes harm to cyclists. Some proportion here, please. Well, I guess the previous terrorists won by segregating people onto sidewalks and cars onto streets. How would society ever survive people on bicycles being safe? Yeah, putting up something to block the light would be a good thing. Not a problem southbound, but northbound can be quite bad. No, but thanks for putting words in my mouth. Skinny bollards should do the trick just fine. It might also help if it were considered plainly unacceptable for any motor vehicle to ever occupy dedicated pedestrian or cyclist spaces, aside from specially marked maintenance and emergency vehicles that never operate in such spaces in excess of walking speed. As it is, nobody finds it unusual when a random truck operates along a bike path at high speed, and I think something’s wrong with that. Threatening to kill pedestrians or cyclists for whom you don’t wish to wait, when the law requires you to wait for them, is a deliberate act of violence – and it’s no accident if you follow through on that threat. Again, this was a deliberate act of terror, and has nothing to do with everyday bad behavior by road users. I think bollards and barriers may help in some black spots, but I would not want to see them everywhere. Again, this was not a road rage incident, which are in fact fairly rare. Sounds like you are experiencing these things more than most of us. I cannot assess why that is without knowing more about where you ride, how you ride and so on. If you ride where traffic moves quickly, you may constitute more of an obstruction than if traffic is crawling. If you ride aggressively you may get more pushback then if you ride conservatively. More generally I think cyclists who also drive do a better job of spatial positioning vis-a-vis vehicles than non-drivers. But in every road rage case I have seen, both parties behaved badly and escalated. It takes two to tango. Might not be a bad idea to put bollards in a bike path every so often so that even if a vehicle made it onto the path it couldn’t go very far. And maybe some of us do. No doubt. Shall we let the voters decide what kind of city they want? Who said anything about road rage? It’s tolerated, it’s treated as normal, it’s completely accepted – and it is absolutely illegal and dangerous. Morally, it is no different from holding a gun up to somebody’s head in order to persuade him to hand over the contents of his wallet. So, no, it doesn’t take two to tango. Only the motorist is violating the law here, and only the motorist is using a weapon (yes, that friendly car of yours becomes a vehicle the moment you deliberately threaten someone’s life with it). Well, again, I’ve been a pedestrian all my life, and what you describe has never happened to me, yet you claim it happens to you all the time. The only reasonable conclusion is that I am street-aware and you are not. Assuming this action was deliberate then I only know of two possibilities. Either it was terrorism or it was road rage. The other options are all accidents. Y, rode there yesterday and it’s odd when a car or truck is driving towards you. Again? This is the first in this comment threat that you’ve mentioned how you get around. I’ve been a pedestrian all my life, and what you describe has ever happened to me, yet you claim it happens to you all the time. Then either (a) you don’t live or spend time in New York City (which is the city that this website focuses on), or (b) you don’t understand a word I’ve said, or (c) you’re lying. Motorists in New York City routinely cut off pedestrians who have the legal right-of-way, in violation of §4-03(a)(1)(i), §4-03(c)(1), and §4-04(b)(1) of the New York City Traffic Rules. The motorist in these situations is required to wait for pedestrians to go first. A motorist who cuts off pedestrians who have the legal right-of-way is directly threatening to kill or injure any pedestrian who doesn’t volunteer to cede his or her right-of-way to the motorist. Motorists do this because they know that the police don’t care in the slightest. The only reasonable conclusion is that I am street-aware and you are not. Believe me, I’m quite street-aware. Unlike you, I’m plainly aware that many motorists deliberately use their vehicles as weapons, to threaten pedestrians who they don’t feel like waiting for. (shrugs) You’re welcome to pigeonhole the practice I described – motorists threatening to kill pedestrians or cyclists for whom they don’t wish to wait, when the law requires them to wait – into whatever category you wish. If somehow you’ve arrived at the conclusion that there are only three choices, then pick one of those three. I really don’t care. It’s still a deliberate act of violence, whatever name you wish to give it. I am perplexed that you so fervently believe that terrorism-by-vehicle can’t possibly be addressed in a similar way to other “bad behavior” (to use your terminology) by motorists. I am even more perplexed that you so adamantly insist that we address only the former but not the latter, even though the latter costs far more lives. Not that we have to pick one or the other. Let’s address both. If drivers are constantly threatening you I have to question your behavior. They never threaten me. Again, never happened to me, seven years in NYC. So apparently it’s not just me. Sure, it’s not just you. But that doesn’t mean it’s everyone. How you behave determines the outcomes you get. So please tell me how Jane Pachuta and Lori Adelman and Michael Cooper and I should “behave” in order to avoid having our lives threatened by impatient motorists. Please also explain how your recommendations relate to §4-03(a)(1)(i) and §4-03(c)(1) of the New York City Traffic Rules, which govern the movement of motor vehicles and of pedestrians facing permissive signals. Nobody can remove all risks, nor immunize against irrational behavior by others. But at the margin we do have some control over our outcomes. Do you rife fast or slow? Do you ride aggressively or conservatively? Do you take risks to save time, or ride more slowly and defensively? Do you ride to the left or the right? Do you take quieter, safer streets even if that increases your journey time? Do you run stop signs and lights, or always obey them? Do you resent coming to a halt, or accept it with patience? The reality is that cyclists and pedestrians do have differing experiences out there, and a part of that is informed by our own behaviors. My experiences are definitely more benign than yours, and there are reasons for that – I am not assertive, aggressive and entitled. Nor do I travel with hostility towards others. It’s a mental things and I’m willing to accept that you would find it psychologically difficult to be as conciliatory and deferential as I am. Pardon? As I’ve already said, I don’t ride a bike. Like the New York Times article I cited, I’m discussing pedestrians crossing the street. I asked you yesterday how Jane Pachuta and Lori Adelman and Michael Cooper and I should “behave” in order to avoid having our lives threatened by impatient motorists, and I asked you to relate your answer to §4-03(a)(1)(i) and §4-03(c)(1) of the New York City Traffic Rules, which govern the movement of motor vehicles and of pedestrians facing permissive signals. The same things apply as a pedestrian. Do you walk out aggressively because you feel you have the right of way or should have? Or do you wait for a break in the traffic? Do you walk slowly when crossing the road, maybe with your head stuck in a phone or paper? Or walk briskly while maintaining full awareness? Do you wear light, bright clothes at night for easy visibility? Do you make eye contact with a driver before stepping out? Given that your experiences are different and worse than mine, you’re doing something wrong. Exactly what that is cannot be determined without seeing you in action, but I suspect from your rather strident tone here that that may carry through into your walking style. Snow and ice made parts of the greenway nearly impassable during the morning rush. It appears the state DOT and Hudson River Park Trust still haven't figured out how to work around barriers put in place to keep motorists out.